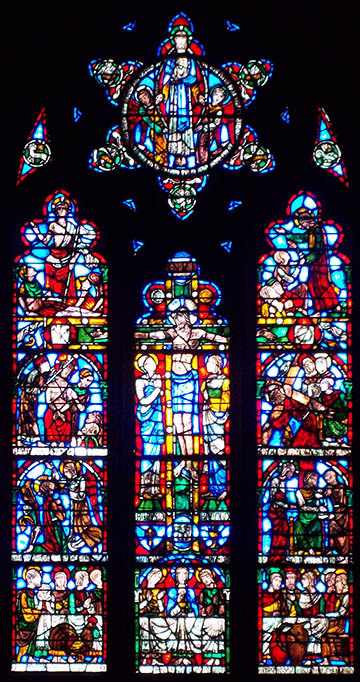 This window follows Jesus from the Last Supper to the Ascension. •	The Last Supper (lower segments, crossing all three panels): Take and eat for this is my body; Drink ye all of this for this is my blood; which shall be shed for the remission of sins (Matthew 26:26-28). •	The Agony in the Garden (lower left above Last Supper): There appeared an angel from heaven (Luke 22:43). •	Before Pilate (lower right above Last Supper): I am innocent of his blood (Matthew 27:24). •	Crowning with Thorns (middle left): They put a crown of thorns upon his head (Mark 15:17). •	Bearing the Cross (middle right): They forced Simon to carry his cross (Matthew 29:32). •	The Descent into Hades (top of right panel): (I Peter 3:18-20). •	The Resurrection (top of left panel): (Matthew 27:62-65 and 28:1-6). •	The Ascension (rose at top): He was taken up to heaven sitting on the right of God from there he shall judge the living and the dead (Acts 1:9-12). •	The Gospel Writers (petals of rose clockwise from upper right): symbols of Mark (lion), Matthew (winged man), Luke (winged ox) and John (eagle). The lowest petal shows a peacock.